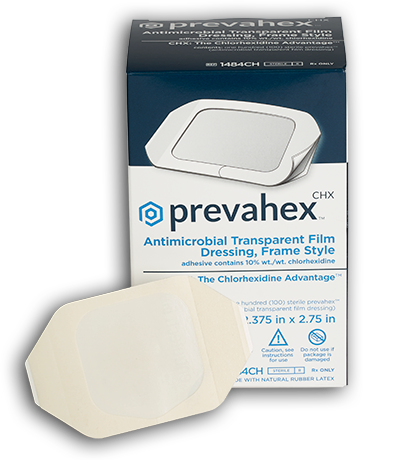 New PrevahexCHX™ is the first and only CHX dressing cleared by the FDA with complete antimicrobial protection throughout the transparent areas of the dressing. PrevahexCHX antimicrobial dressing incorporate groundbreaking technology utilizing pure chlorhexidine, providing rapid, broad-spectrum dressing protection at wound and catheter sites. - John S. Foor M.D., F.A.C.S. 5 Reference: Maki, D.G., Cobb, L., Garman, J.K., Shapiro, J.M., Ringer, M., Helgerson, R.B. An attachable silver-impregnated cuff for prevention of infection with central venous catheters: A prospective randomized multicenter trial. Am J Med 1988; (85): pp. 307-314.